Yesterday Diane drove Rhonda, Emily, Rhoda and me in to the shop for our Berean job. Hind sight we should have driven 2 cars...later on that. 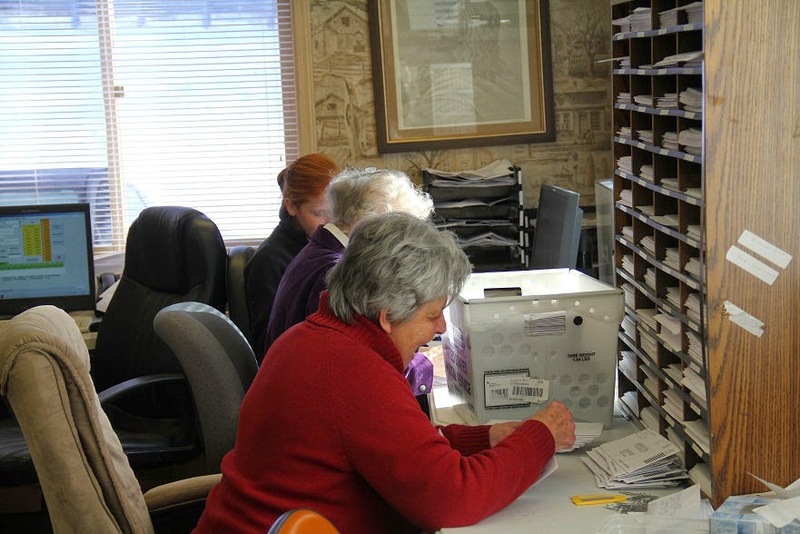 We had another huge mail day at Berean, Rhonda, Rhoda and Diane got straight to work on labeling the Bibles from Thursday's mail (we cruisers weren't here to process that). 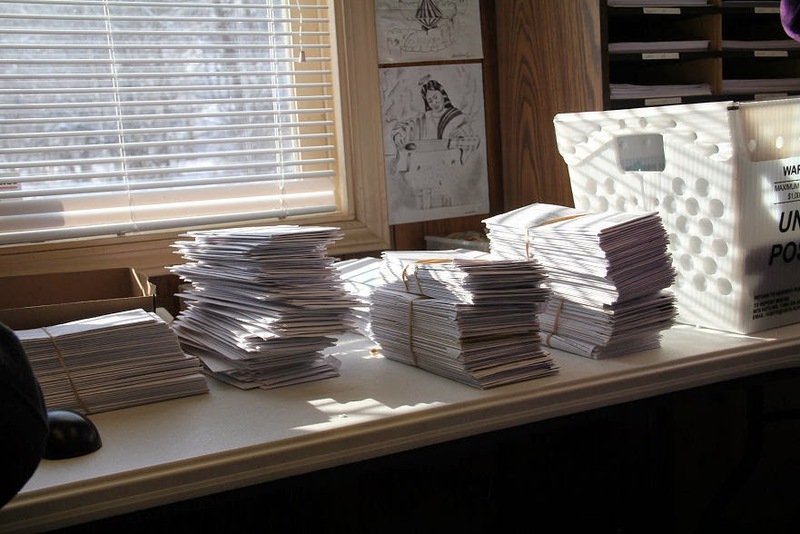 Below they have almost emptied the mail tub, they have the studies to be processed on one side of the tub while the letters to be read are on the other side of the tub. Emily and Eva Jean worked on opening the studies while Shirley and Diane read letters. When Joyce arrived we all started cheering. We were so short of workers and there was just so much to do. Rhoda and Joyce spent hours labeling the Bibles, then Rhoda would haul them out to Diane's van. We went through all the wrapped Bibles just from the labels printed out yesterday. After the studies were finished it was well past noon. I was more than ready to quit for the day but Diane felt we should put in a few more hours. Below are the letters all read and sorted by city to be entered. I sat down again at the computer and started entering and printing out the labels as fast as possible while the rest stuffed and wrapped more Bibles. By late afternoon we were all getting tired and cranky. 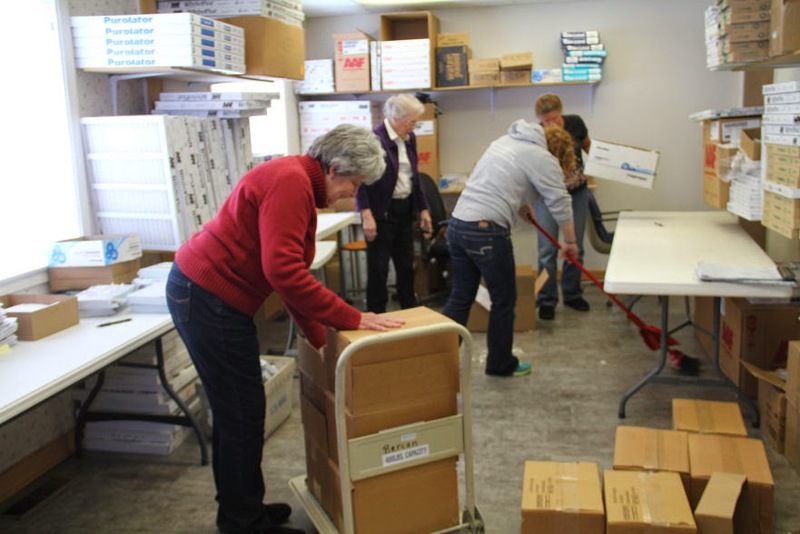 Below Shirley is loading more boxes while Rhoda, Diane and Eva Jean are cleaning up the office. Emily is out loading more Bibles into Diane's van. Below Eva Jean is leaving for the day while Rhoda and Emily are trying to stuff the last few boxes into the van. 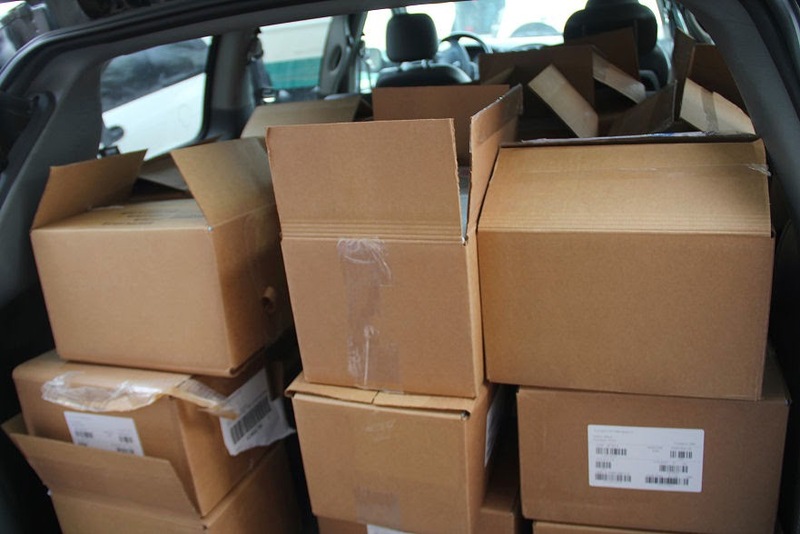 So the reason we should have driven 2 vehicles is Diane's van was way overloaded with almost a ton of Bibles. It really was close to 2000 pounds! Diane mentioned, "if my tires pop Berean is going to have to buy me new tires." 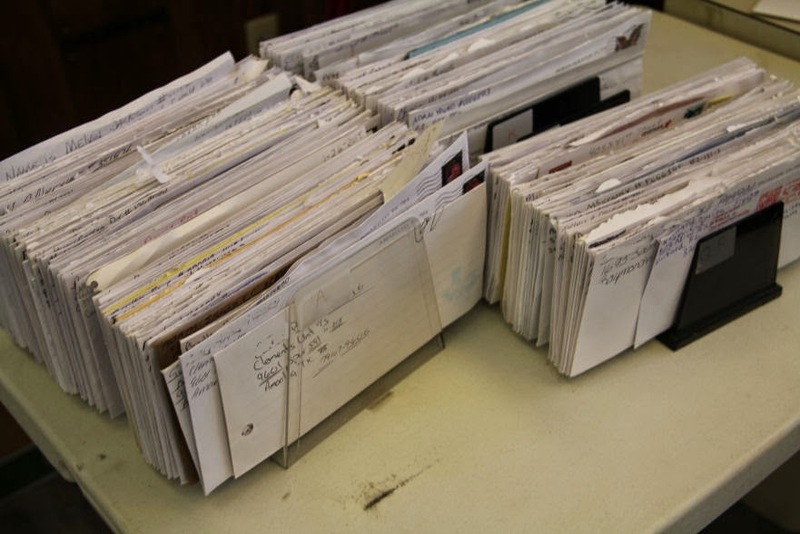 I brought some of the letters home which will be posted here later today along with another installment of Spark's notes from the Peoria County Jail.